You might remember I ripped out all my Lavender plants four months ago and replaced them with new plants. 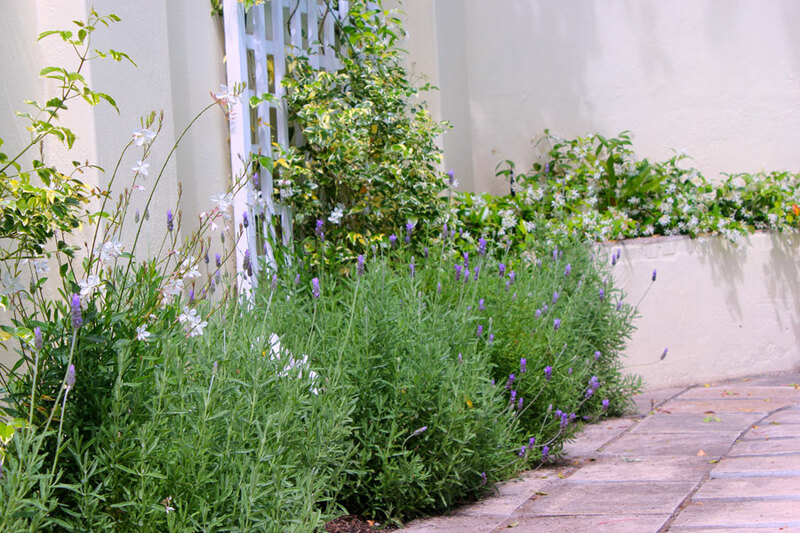 (I blogged about it here: New Lavender to replace the old). Shortly after I planted the new Lavender I acquired a four pack of Gaura lindheimeri seedlings. Not really having a plan for them them (impulse buy), I thought they might look nice peeping through the Lavender. I planted the four seedlings at intervals behind the Lavender and whilst it’s probably not exactly “designer garden”, I think they look rather pretty floating above the Lavender. The Star Jasmine is doing well and filling the evening air with its lovely scent. That combined with the smell of Lavender when I walk around the pool area is really delightful. 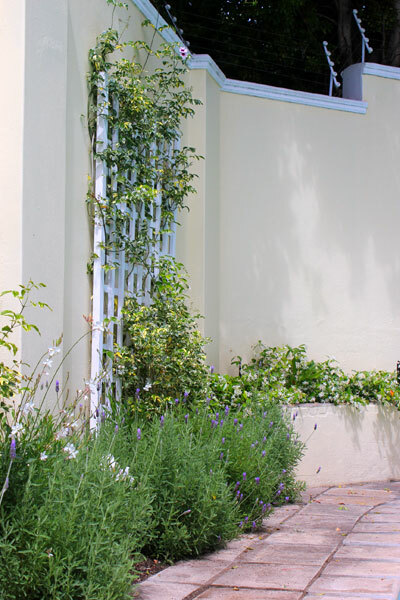 The Star Jasmine is flowering prolifically and the trellis I trained it onto is almost a mass of green and white, but my favourite is how it is “tumbling” down the wall in the spot where I did not want it trained upwards but let it cascade down the wall at the side of the pool. Its coming on slowly and looking better than I had expected. In other news – I did a massive clean up in the back garden today. Ground covers were running rampant and needed severe cutting back, lots of weeding to be done, yellowing leaves had to be removed from the Aggies, a few bulbs needed planting … and a whole lot more kept me busy all day. By the time I thought of taking photos for a blog post or two the light was gone and I needed a well deserved and rarely taken “Sunday Afternoon Siesta”. Have a great gardening week! 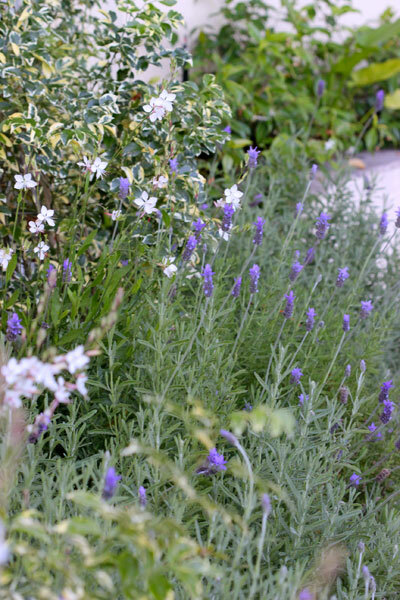 Love the Gaura and Lavendar combo — both favourites of mine. Where did you get your white Gaura seeds from? I’m in Cape Town and I’ve seen the white gaura plant once at Starke Ayres. Lately I’ve only seen the dark pink (Ballerina, I think it’s called) in seedling trays. I bought a tray and they have grown very well. But I prefer the white/light pink plants, but haven’t found seedling trays for them. Hi Marilyn … I honestly can’t remember where I bought them. It was a seedling tray with 4 seedlings, I think I bought them at Strake Ayres, but I can’t be sure. I agree about the white – I have the pink too, but I MUCH prefer the white now I have both and compare the two. Next year I will replace the pink with white (if I can find them again). This is such a stunning combo – works so beautifully in this position. AND your photos are just so inviting – beautiful, my friend! 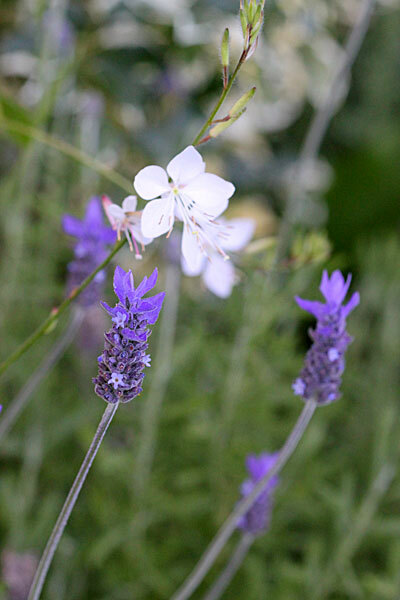 I grow a lot of lavender here, but no Gaura. I did grow Gaura in our last garden though, and I love the delicate look of these blooms suspended on their willowy stems. They move so beautifully in the breeze. 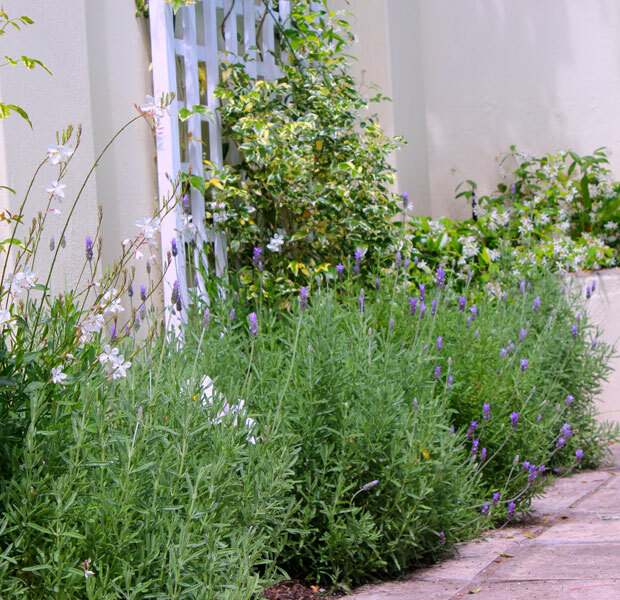 The plants themselves aren’t much to look at out of bloom though, so I think mixing them in with the lavender is a wonderful way to accentuate their best qualities, the flowers! Clair, you are so right – they don’t look particularly impressive on their own, do they? I have some I planted elsewhere in the garden … all on their own and they kinda look a bit boring there. Gaura and lavender are both plants I have an emotional attachment to, but it is unrequitted love. They both have suffered and ultimately perished in my soil, though I tried hard to improve it for them. I am so jealous of yours! I think the combination is lovely. 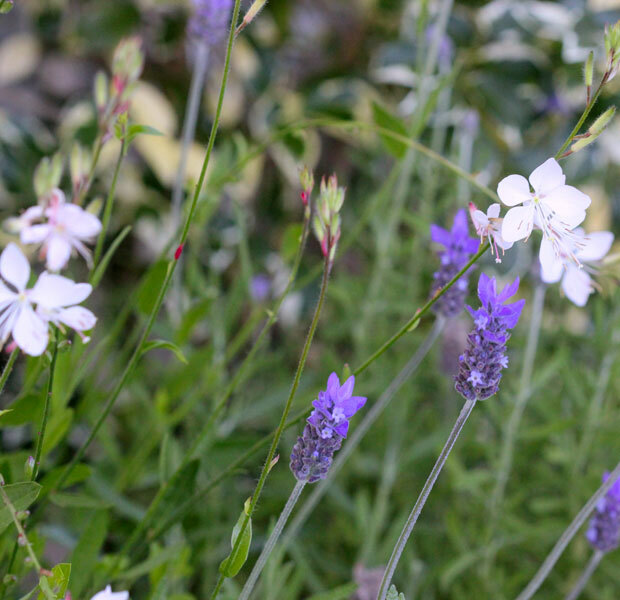 Hi Debs – How strange – both the Lavender and Gaura in my garden get very little attention from me and are not in the “best” soil. Perhaps you cared too much? It is a beautiful combination. And I am glad that you did not let any “designer’s” snobbery stop you! It seems easy for designer to forget the soul of the garden, and the simple appeal of prettiness, in the midst of all the rules. And I am a huge proponent for good design rules… but still I think a real gardener know when to break them. Well done! OK, I just read Stuart’s blog – I get it now. I just love the combination – I think it is designer gardening! I’ve been working on Christmas more than at blotanical, but I’m looking forward to the new version. But – what does Diana mean – 13 blogs lined up for Version 2? Are they not all transitioning? Maybe I should read the blog! They make a pretty combo. I have used these together before along with cosmos, minus the jasmine, in gardens I have designed, one, in a bed surrounding a patio. It was so romantic a look, just like it does here. Oh yes, the two plants look magical together! And the scent must be wonderful. It’s good to take your siestas when you can. Gardeners work hard! I think the combination looks great! Gaura is one of those plants that just seems to keep going all summer long too. Frustrating that it won’t overwinter here for me. Guara is a favorite here in my hot, dry garden…it is one tough plant that can take the extremes of our weather. I like your combination with the lavender and the way the little flowers float above it…very pretty. It looks more than rather pretty! 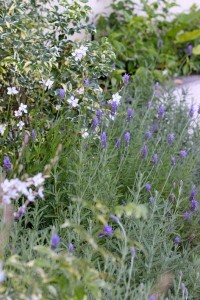 I love both lavender and gaura, but have never thought of planting them together. What a great insight. They look beautiful together. 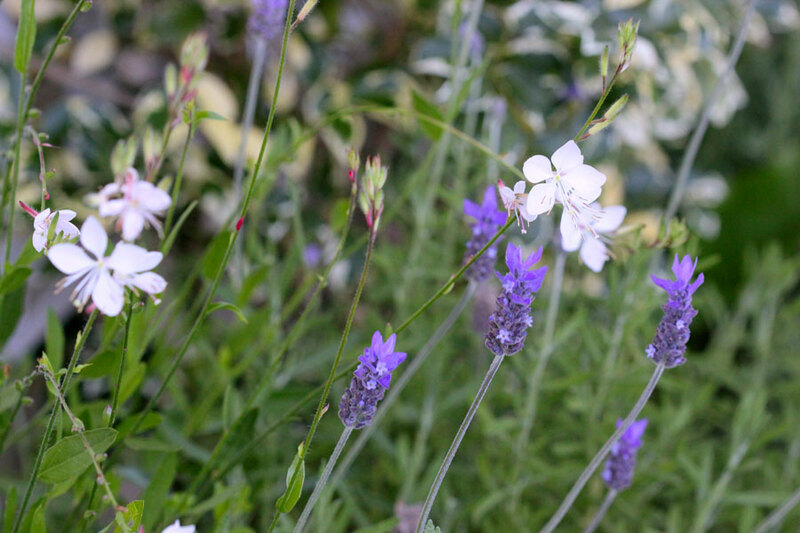 Lovely photos of your Gaura and lavender. Chris at Garden Sense had a great post on Gaura with fountain grass that you might like to read. I have to admit that the whole changes to Blotanical thing makes me nervous. I am afraid that one morning I will go on Blotanical and nothing will work anymore. I read gardening blogs through Blotanical so it is important that I know how it works. Hi Carolyn, I think you’ll find the new Blotanical much easier to navigate! Stuart is doing some great things and its looking good! The Gaura look very pretty amongst the lavender. Sometimes non-plans work out great! I agree – this one really surprised me! Last I looked there were 13 blogs lined up for Version 2. You’ll be there next time I look! Your garden is looking pretty and romantic, in soft gentle colours.